Forecast shows your remaining tasks for the day and your calendar events, all in one place. It’s handy for planning your day and for doing what needs doing. In OmniFocus 2, tasks and calendar events were separate lists on the same screen, and it was up to you to look back and forth to notice that a due date couldn’t be met because of an event in the way. These lists are now interleaved in OmniFocus 3 — that is, it’s a single list, in chronological order, of tasks and calendar events. This makes it much easier to see what your day is like, and it makes it easier to rearrange and plan as needed. 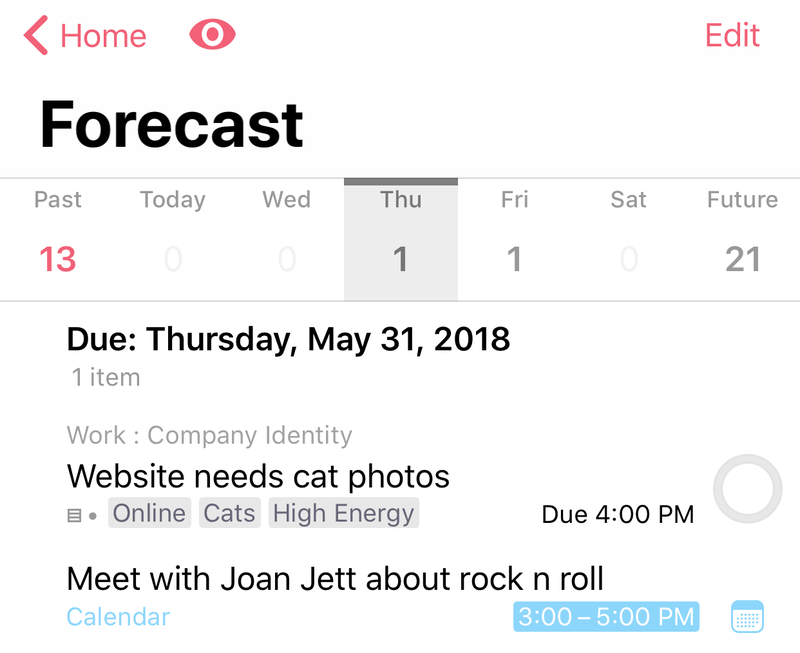 This screenshot show a task due at 4 pm — but there’s a calendar event from 3 to 5 pm. Note that the task is ordered before the calendar event, despite the due date and time, because it needs to be done first.